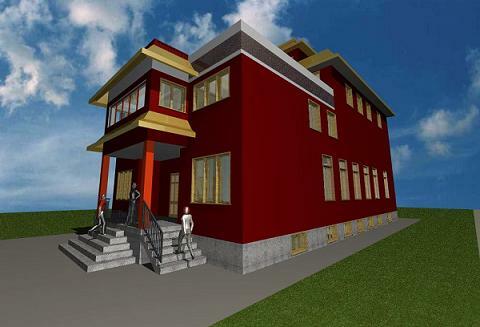 High Park Architects has submitted a Preliminary Project Review application for a new Tibetan Buddhist temple in Toronto and drawings are also well advanced to submit for a Rezoning application. 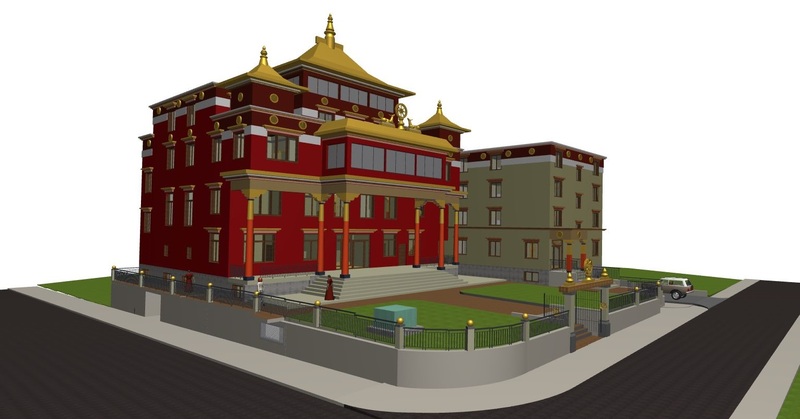 The new temple will be the Canadian Seat of HH the 17th Gyalwang Karmapa, Ogyen Trinley Dorje, Karma Kagyu linage and will be located at 10-12 Maynard Avenue in Toronto. The local community will be served by a large Multipurpose Room with commercial kitchen, 36 car parking spaces and other amenities that can be used for various social events. 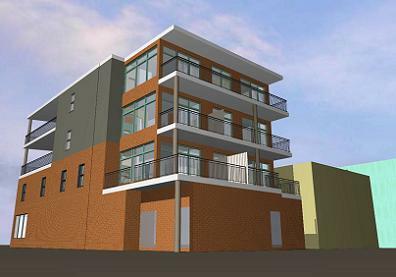 The building will also include 24 apartments which comply with the City Housing Policy requirements. The First Floor layout contains a main entrance, reception, staff office, common areas, library, a kitchen, dining room, bathrooms, coat room, walk around path etc. The building is divided into Temple and Residential uses with separate entrances, elevators & staircases. Second Floor includes the Main Shrine Room with the raised altar, various supporting areas and residential units. 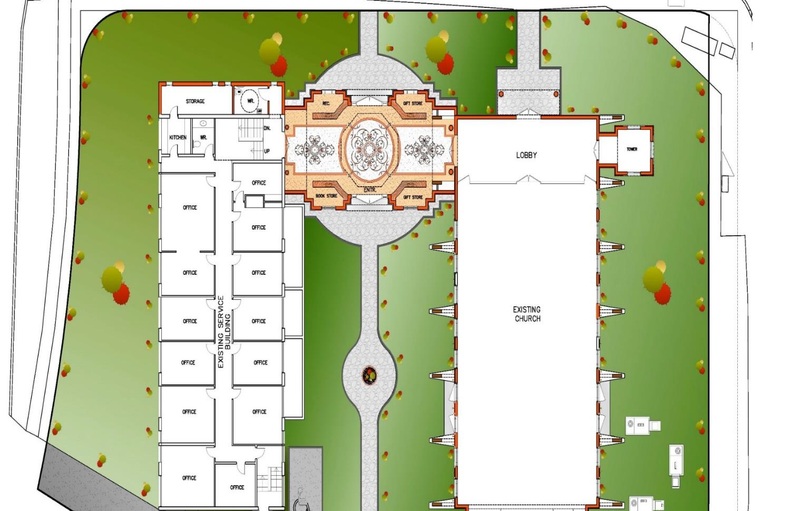 The beautiful new shrine room will be about 18 meters long and 17 meters wide. It is being designed in the traditional Tibetan style with an expansive raised altar at the North, gracious traditional Tibetan style columns, painted coffer ceilings and walls decorated with thangkas. 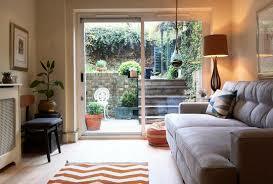 The windows and doors will be also in the traditional style. The central part of the room has a double height ceiling which will accommodate the large golden Buddha statue placed in the center of the altar. Depending on the seating layout and the type of event the shrine room can serve up to 200 people. The Third Floor includes the apartment of the Resident Lama, suites for guest teachers, and residences for the participants of various Temple events, such as teachings, retreats etc. A corridor and stairs provide a connection between the Temple and the adjacent residential part of the building. The Fourth Floor contains the private Penthouse Suite designated for His Holiness the 17th Karmapa. The Penthouse Suite contains a small shrine room, a reception room, a dining room and kitchen, waiting areas and accommodations for attendants. On the west side there will be a viewing terrace and on the east side a large rooftop garden. High Park Architects has been invited to submit proposal for the Coptic Church addition and renovation. The project commencement is pending the board decisions. Ti Agia Maria & St. Demiana the Martyr Coptic Orthodox Church is located on the corner of Islington Avenue and Elmhurst Drive in Rexdale, Toronto. 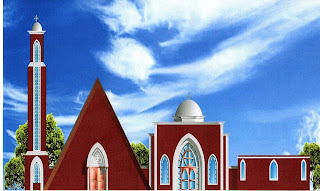 - building a new Coptic style addition which will connect the Church and Services buildings and serve as a formal entrance for the Church. This building will include a main lobby, reception, gift shop and bookstore. - expanding the Services building to make room for a handicap washroom and a bakery (Beth-lehem) for making a Qorban bread. - replacing the windows of the Church building with new Coptic style windows. 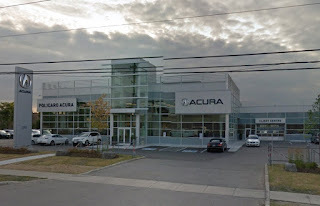 Marek Rozkowski and his partner Andrew Szyplinski have designed many Car Dealerships in the Greater Toronto area. Their car dealership design portfolio include, completed and operational, most prestigious auto brands like: Lexus, Honda, Acura, Toyota, Mercedes and BMW; selling new as well used cars. 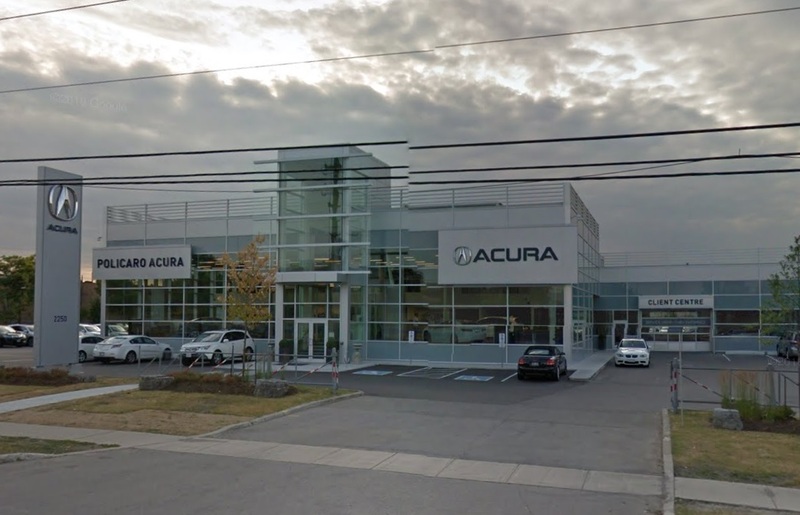 A new addition and renovation to the existing car dealership in Brampton located on 2250 Queen Street East. 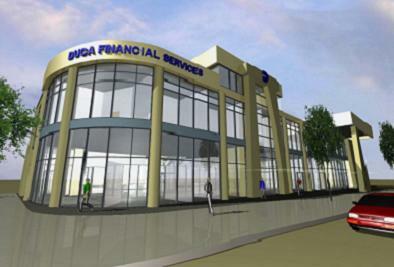 The new addition includes a large showroom, offices, and waiting area. The new front has large glazed areas with bay windows and central car entrance. 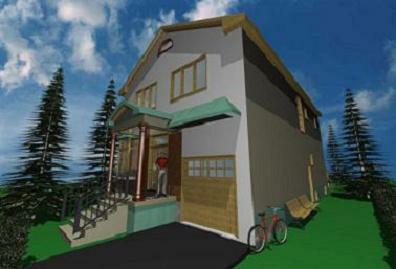 Exterior elevations are cladded with pre-finished and insulated "Alukabond" panels. Additional exterior features like for example the sign pylon were also designed to display the company logo and other corporate identifications. 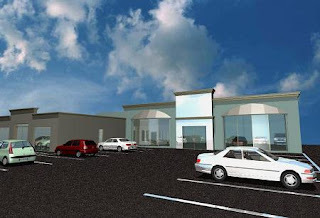 Ground floor addition to the existing car dealership in Toronto West End located at 423 Evans Avenue. The new addition includes two large showrooms, bathrooms and waiting area. The new front has large glazed areas with bay windows and central car entrance. Exterior elevations are cladded with prefinished thermally insulated panels. Interior steel frame construction was designed to accommodate future second floor addition. DUCA Financial Services Corporation Headquarter is a state of the art building with sculpture like shape, green roof, underground garage for customers and other innovative solutions for modern and convenient banking. 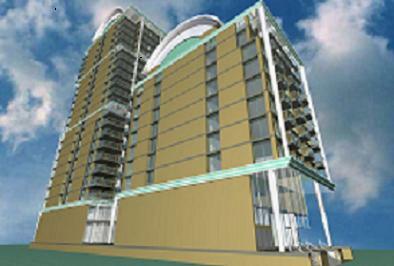 Drawings for re-development of the 5270 Yonge Street site were completed in 2008 . High Park Architects participated in the development of presentations and building permit drawings together with Hendrik Op't Root Architect who was the prime consultant on the project. The building was opened to the public in May 2009. Proposal maximizes existing zoning on one of the Toronto's main streets. Design adds third and fourth floor with five new apartments. The buildings on Toronto main Avenues are for the most part two storey heigh. Those properties have a great potential for residential and commercial development. Toronto Official Plan is underscoring the importance of Main Avenues development for our City future. There is already existing infrastructure in place: utilities, transportation, lighting etc. By increasing overall pedestrian traffic volume the development will have a positive impact on the existing retailers, restaurants and businesses. It will be also beneficial to the adjacent residential areas by enhancing the quality of urban experience and shoring up the property values. 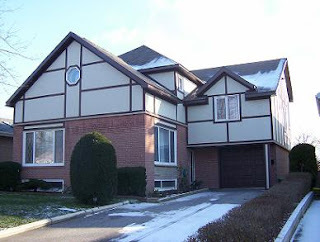 This charming, chalet style second story addition doubled the living space to a rather unremarkable bungalow and more then doubled value of the house. The design addressed the site with the steep ravine behind the house by creating a sculptured roof line with pitched and shed dormers. Ground Floor plan was changed to the open concept layout. Upstairs a three bedrooms, bathroom, Master Bedroom and En-suite Bath were added to the existing house. Overlooking the Ravine a large rear deck is connected to the Great Room and the Family Room. 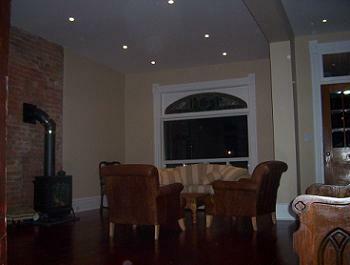 The 2nd story addition to the existing bungalow added three bedrooms and two bathrooms to the house. Exterior on the ground floor elevations was covered with cultured stone, the Second Floor exterior was finished with a Tudor wall. The roof line was modified to combined gable-hip roof form. The canopy was built at the front to provide rain protection at the entry porch. Existing entry stairs and retaining walls were rebuild in stone. 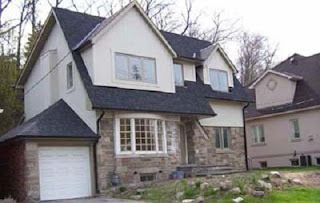 The second storey addition and expansion over the garage transformed the Etobicoke bungalow into a full scale mansion like house with 2nd floor mezzanine overlooking double height family room. The study above the garage created a new level, six steps below the second floor. The floor of the room had to be thermally insulated and gas proofed. The Tudor wall finish at the second floor reinforces a country style feeling. Basement load bearing wall was replaced by steel beams and posts allowing for a big recreation room with a walkout to the backyard. The Committee of Adjustment has approved required variances for the additional Gross Floor Area. 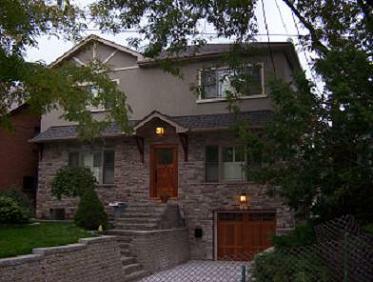 The existing Bungalow was partially demolished and a new two story, four bedroom house was built. The existing foundation walls were underpinned and the basement slab was lowered by two feet that allowed for 8'-6" high ceiling in the basement. The gable roof was designed to allow for a cathedral ceiling at the second floor. Front porch roof and a canopy finished with aged copper add a touch of style to the house in this trendy North York neighbourhood. Two tower condominium proposal at 210 Simcoe Street in Toronto. Drawings were developed with Hendrik Op't Root Architect. The design drawings and renderings were prepared by High Park Architects. The Renovation created a Grand Room - open concept at ground floor by replacing load bearing walls with beams and posts. The room with two fireplaces, arched windows, hardwood floor and 12 foot ceiling has become a focus of the house activities. 150sf rear ground floor addition with a nanny suite was designed and build in the second phase of construction. We have exceeded allowed by Zoning Gross Floor Area so the application to Committee of Adjustment was necessary. Basement Underpinning is the fastest and easiest way to add more room to your house. - Keeps your property taxes and heating bill on the same level. Often times a heating bill goes down since the finished basement has usually a better thermal insulation then unfinished basement. - Less paperwork and fees from City's departments. There are no Development Charges, Park Levies, Urban Forestry applications or other time consuming, expensive submissions or fees for creating an additional apartment or a living space. This price includes installation of new floor drains, weeping tiles, sewage ejector, replacing existing columns etc. Each house is different and there maybe some variances; use the below calculations as a guideline only. Today I was searching for audio visual companies toronto then read this awesome content which has lot of helping material.